So, Psy has released another single titled Gentleman. Now there was confusion about the name and why he even made this song. So, I'm going to clear up some confusion. 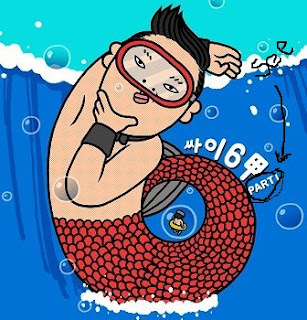 If you noticed on the album cover of Gangnam Style, it says part one. (See picture below). This stating that there is going to be a continuation of Gangnam style and my friends my theory is that, that continuation is none other than Gentleman. Now this video was random...and I feel sorry for the girl who got fart thrown in her face but it's just what I'd expected from Psy. I don't really like the clothes but I think it was nice that they integrated dance moves from Brown-Eyed Girls into the music video.